Jake McCabe scored a goal and Logan Nelson provided offensive spark Saturday as Team White opened the USA National Junior Evaluation Camp with a 5-2 win over Team Blue. The teams will return to the ice on Sunday for a 4:00 rematch. I should say that the teams will return to the "soft" ice, as the 90+ degree heat in Lake Placid delivered a chippy surface that challenged the players from the get-go. 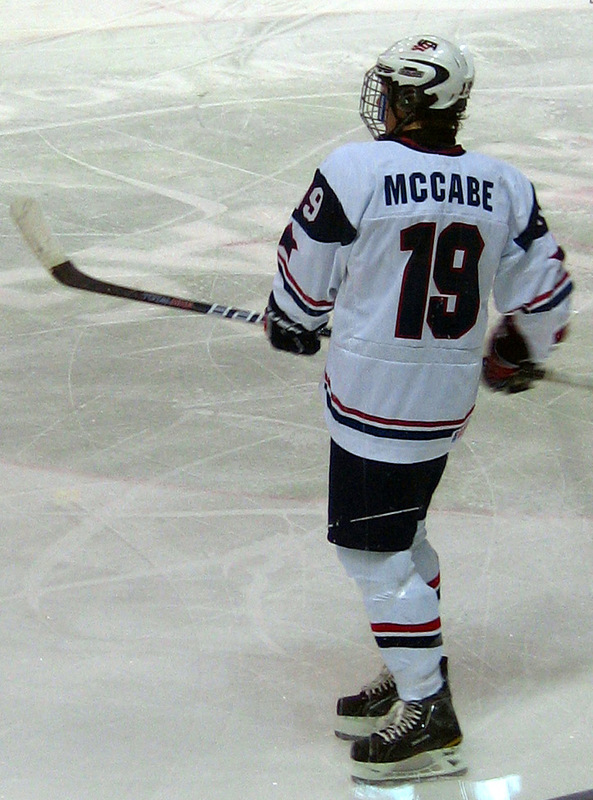 McCabe, wearing jersey #4 in white, started each period on the left point opposite Notre Dame's Robbie Russo (NYI). He began the game well, showing good vision out of his zone and a smart stick that allowed for a few key clears. The second and third periods had peaks and valleys as good offensive chances were balanced out by some mistimed hits and passes. His third period goal stemmed from good awareness by stepping into the high slot to bury a shot. Nelson (#22) skated at wing on a line with Cole Bardreau and Blake Pietila. The unit was unable to score but maintained a quick pace throughout, providing pressure and action around the Blue cage including plays off the draw. Nelson unofficially registered three shots on goal and nearly had an assist when his no-look backhand feed from behind to the net went right to Cole Bardreau for a point-blank opportunity. Later on the same shift he corralled a puck in the left corner and made a strong move to the net where his stuff attempt was thwarted by Providence-bound netminder, Jon Gillies. Blue dominated play for the majority of the opening period, finally striking with a Colin Blackwell (Harvard) goal at 14:46. White would quickly even the score when Sarnia Sting sniper Reid Boucher finished a play less than a minute later to knot the game 1-1 heading into the first intermission. The teams began the middle frame with a quick exchange as Travis Boyd (White) and Sean Kuraly (Blue) scored within the first two minutes of play. White would get the go-ahead goal with less than seven minutes left when Seth Jones rocketed a pass from his goal line up the left side to Boucher, who hit a streaking Alex Broadhurst for the finish. White continued to capitalize despite the poor ice conditions in the third. McCabe beat Gillies to make it 4-2 at 9:59. Nealy three minutes later, Tyler Biggs provided the game's final tally by scoring from in front while on a 4x4. Michigan commit Jacob Trouba, who was one of USA's better rearguards at the 2012 WJC, was a healthy scratch but could play on Sunday as the split squads prepare for Monday tilts with Finland (Blue) and Sweden (White) before the camp's main cutdown.